Get your feet wet by trying out a kayak or stand-up paddleboard at one of the marinas. 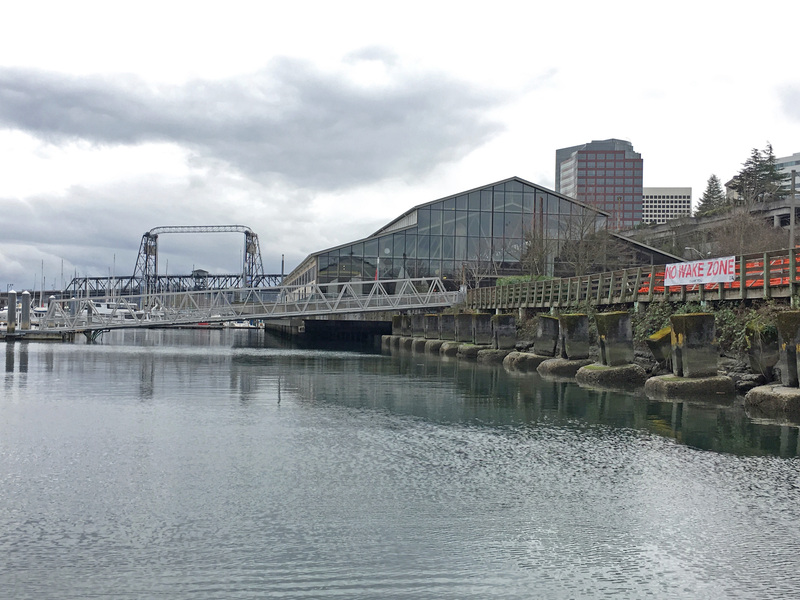 The Foss Harbor Marina and Dock Street Marina offer rentals on the Foss Waterway. Metro Parks Tacoma offers kayak rentals at Owen Beach in Point Defiance Park. Cost: Rates can vary and average about $25 for a two-hour, single kayak rental. Enjoy working out with teammates with a South Sound paddling club, or cheer for the paddlers at a race in Tacoma! Dragon boat. The Tacoma Dragon Boat Association (TDBA) paddles year-round for recreation and competition. Membership is $100 per year. To see if dragon boating is for you, join them for a practice! Your first three practices are free. Outrigger Canoe. As a way to share Hawaiian culture, Kikaha o Ke Kai paddles outrigger canoes on the Foss Waterway, Puget Sound and beyond. Membership is $115 per year for an adult in your first year. Membership is less for youth ($50 for youth living in the Tacoma area). Kikaha will hold the Tacoma Doublehull Challenge at Thea’s Park on August 4. Here are some photos of the 2017 Ruston Relay (from Kikaha’s Facebook page). 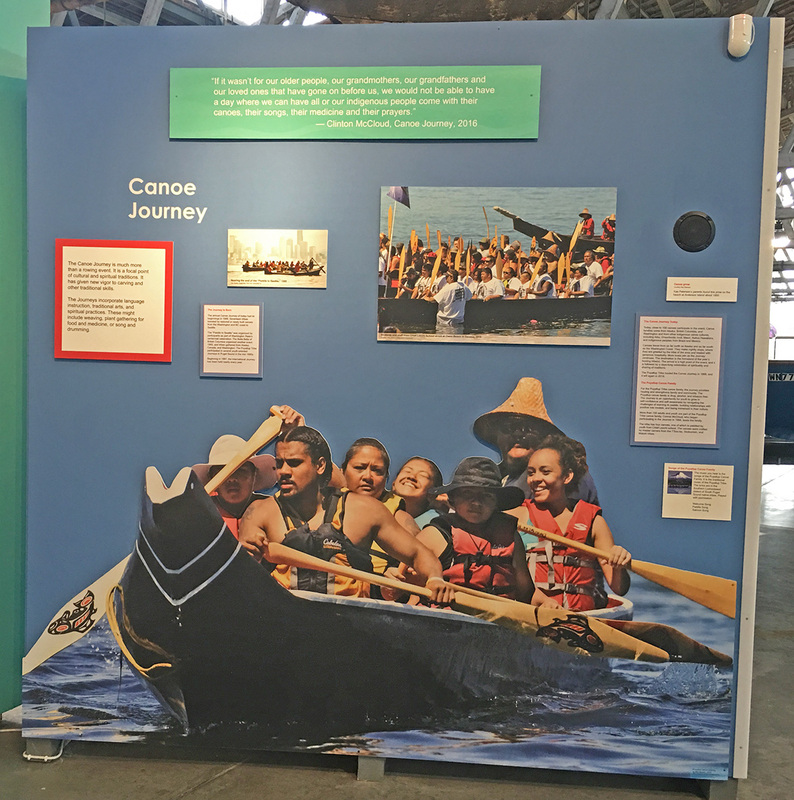 The Canoe Journey is included in the “First on the Waterways: the Puyallup People” exhibit at the Foss Waterway Seaport. The largest paddling event in Puget Sound will occur this summer when the Puyallup Tribe of Indians hosts the Puyallup Tribal Canoe Journey, July 28 – August 4. Approximately 15,000 people from tribes all over the northwest are expected to attend. The public is welcome to watch the paddlers arrive in Commencement Bay. James Rideout, Puyallup Tribal Councilmember, discussed the Canoe Journey at a Tacoma Waterfront Association meeting in March. His talk is described in TWA’s blog post. Last summer, the Foss Waterway Seaport and Tacoma Youth Marine Center teamed up to teach kayak and paddleboard classes. They may do so again this year. Lots of paddlers during Maritime Fest 2016. Kayak class on the Foss Waterway. Tacoma Maritime Fest on July 28 and 29. South Sound Magazine‘s May 18, 2018 article about the Rainier Dragon Boat Festival. Video of the Paddle to Nisqually boat launch from Owen Beach in July 2016. In anticipation of the Puyallup 2018 Canoe Journey, this video gives you an idea of what a Tribal canoe journey looks like. If you know of other paddling clubs in the Tacoma area, please let Liz know. I’d be happy to include them on this list and help get the word out! Thank you! One of the benefits of being a small business owner is making time to give back to community. We are a nation of immigrants, and I’ve been looking for ways to help immigrants in the South Sound. I’m proud to help immigrants prepare for their U.S. citizenship interview as a volunteer in Tacoma Community House‘s Citizenship Classes. This weekend I volunteered in a citizenship class for the first time — so inspiring! I teamed up with another volunteer, and we met with three people independently (three people from three different continents). In reviewing civics questions, I helped them learn more about the U.S. government (for example, what are the three branches of government, what are two major political parties, who is one of your U.S. Senators). At the same time, I learned more about their counties and cultures. It’s a great learning environment for the immigrants and volunteers! In working for the Pierce County Auditor‘s Office last year, I learned about the Auditor’s work with Tacoma Community House, the Washington State Sons of the American Revolution and others to hold a Citizenship Celebration. In this celebration, immigrants take the final step in becoming U.S. citizens and are honored in Pierce County. As U.S. citizens, they can vote — something many are excited to do! My education and work experience should help immigrants in this citizenship class. I earned a Master’s degree in international relations and started my career working for a U.S. Senator and then a federal agency in Washington, DC (the legislative and executive branches). I’ve made friends from all over the world, and am excited to help make a difference in my community! Visit Tacoma Community House’s webpage to learn more about their free Citizenship Classes. The waterfront along Ruston Way in Tacoma. Metro Parks described the Dickman Mill project. Metro Parks will restore the huge head saw that worked in the old Dickman Mill and publicly display it in Dickman Mill Park along Ruston Way. The expanded park would include a plaza area to view the head saw. This head saw is the last known to operate in Washington. Metro Parks gave an overview of the project, including the preferred location for the head saw. Liz Satterthwaite with Engage Northwest represents the Tacoma Waterfront Association on the Dickman Mill Steering Committee. See Liz’s previous blog post about this project. The City of Tacoma and Metro Parks Tacoma are starting a project to envision the future of Ruston Way in the next 50-100 years. Public input is important! The City and Metro Parks are interested in knowing what people like about Ruston Way and what improvements would be needed. They are looking at infrastructure, art, activities and more. To learn more and be involved, visit the project webpage and sign up for Metro Parks’ email updates. The Foss Waterway Development Authority and Metro Parks plan to build two new parks on the Foss Waterway: Central Park and Waterway Park. Central Park would extend the public esplanade, create a new walkway to connect Dock Street to the waterfront, and include a play mound and a smokestack-looking tower inspired by the area’s industrial heritage. Waterway Park would turn the existing Berg Scaffolding building into a boathouse with restrooms and boat storage for outrigger canoes, dragon boats, kayaks, and stand-up paddleboards. See Metro Parks webpage for more information about these projects. Waterfront parks are true gems in Tacoma! Thanks to voters saying yes to park bonds in 2014, Metro Parks Tacoma is improving many waterfront parks now, including Titlow and the most popular park in the South Sound — Point Defiance Park. I plan to provide more information about these park improvements in a future blog post. Presentation slides and live video from Metro Parks Tacoma’s March 15 waterfront open house is available on their website. The Puyallup Canoe Family members drum and dance during the grand opening ceremony. The Foss Waterway Seaport opened an exhibit about the Puyallup People — “The First on the Waterways: the Puyallup People” on Feb. 15. The grand opening featured a traditional Puyallup tribal blessing and song and dance. The exhibit tells the story of the Puyallup People and their connection to the waterways. Learn from artifacts, hands-on activities, multi-media displays and more. In summer 2018, the Puyallup Tribe of Indians will host the 2018 Canoe Journey — exciting! At the grand opening of the “Puyallup People” exhibit, Puyallup tribal members talked about hosting the Canoe Journey. Tribes from all over the Pacific Northwest will paddle along the shores of the Salish Sea to make their way to Puyallup. Thousands are expected to make this spiritual journey. The museum’s exhibit includes a section about Canoe Journeys. Tribal members also carved paddles during the grand opening ceremony. The Puyallup 2018 Canoe Journey is planned to be open to the public. Learn more about the Puyallup People and the Canoe Journey at the museum! A Puyallup Tribal canoe welcomes visitors. Information about Tribal Canoe Journeys. A Puyallup Tribal member carved paddles during the exhibit’s grand opening. The unveiling of the “Puyallup People” exhibit. Museum visitors enjoy the “Puyallup People” exhibit. 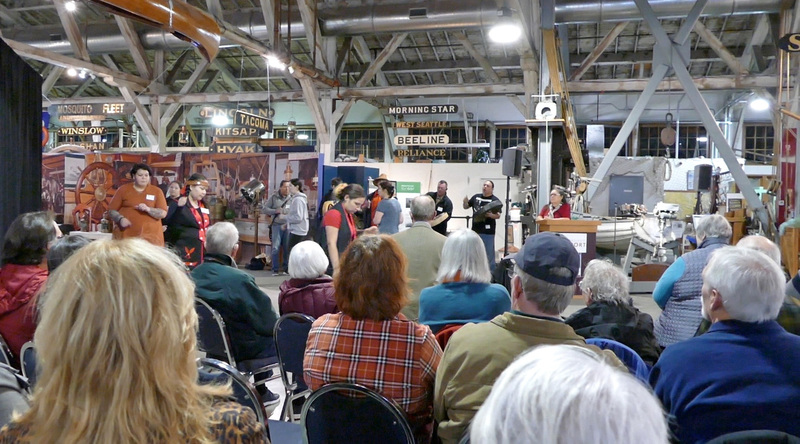 If you couldn’t attend the grand opening, you can still see the “First on the Waterways: the Puyallup People” exhibit! It’s now part of the Seaport’s permanent displays. Foss Waterway Seaport’s website about the exhibit. Puyallup Tribe of Indian’s website about the Puyallup 2018 Canoe Journey. Tacoma Weekly’s article “First on the Waterway” about the exhibit. Video of Puyallup Culture Director Connie McCloud giving the blessing at the grand opening. Attend the Tacoma Waterfront Association’s meeting on March 14 at 11:30 a.m. at the Tacoma Youth Marine Center. Puyallup Tribal Councilmember James Rideout will discuss the Puyallup 2018 Canoe Journey and related topics. Free!